This hasn't happened in nearly a decade. Not since 2008 has the U.S. stock market done what it's about to do. And this key shift is terrifying investors. The U.S. stock market is almost certain to end 2018 in the red. The S&P 500 is down around 6% this year as of yesterday's close. It would've taken a monumental surge for that negative to turn positive over this week or so... And I didn't expect it to happen. Folks have been asking me this question more and more in recent weeks. I've become "Mr. Melt Up" over the last couple of years... so it's not surprising that those who follow my work want an update right now. Given the recent market volatility, my answer might surprise you... I'm not worried. Not at all. I still believe the U.S. stock market can soar in 2019. I also hope to prove to you that this isn't a "dug in" position. I'm not staying bullish just because I'm Mr. Melt Up. I'm willing to change my mind when the facts change. But they haven't changed yet, so I still see opportunity. I have simple criteria for finding great investments, and U.S. stocks check all the boxes right now. It's too easy to get emotional when investing. Losing money isn't abstract – it's tangible. If your portfolio falls tens of thousands of dollars, you didn't just lose numbers in a spreadsheet... you lost a car, or a dream vacation. You can't make emotional investment decisions, though. That's a recipe for disaster. It's also why I spent a career developing my own strategy for investing. It's simple, but it works. Longtime readers know exactly what I'm talking about... I look for investments that are cheap, hated, and in an uptrend. If you can find these three criteria in an investment, you're all set. Everything else is mostly irrelevant. It's just noise. Today, there's plenty of noise in the U.S. market. It's easy to find reasons to worry about stocks. The bull market is darn old. Uncertainty is high, and so are geopolitical risks. The Federal Reserve is actively hiking interest rates. The market has taken a beating in recent weeks. Still, if you strip away the worries and simply look at the important numbers, there's also plenty to be excited about. I get strange looks when I tell people that. It either spooks them, or they think I'm a kook. Most folks believe stocks must be expensive after the spectacular bull market we've seen. The problem is that it isn't true... not at all. The point of the CAPE ratio is to smooth out distortions caused by the business cycle. It looks at 10 years of stock prices and earnings (along with inflation) – not just one year. The CAPE ratio peaked at the end of 1999 – right around the stock market peak. It bottomed in March 2009 – exactly when the stock market bottomed. The CAPE ratio has risen dramatically during this bull market as well. But that only tells part of the story. 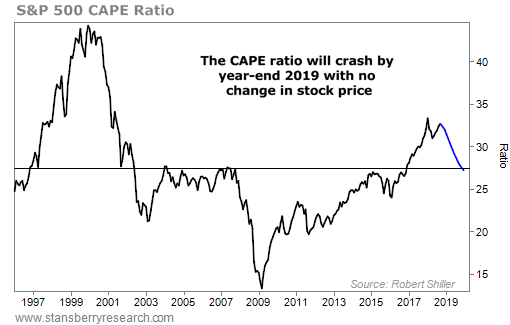 The CAPE ratio is about to fall dramatically by the end of next year, assuming no change in stock prices. One, analysts estimate that the earnings number used in the CAPE ratio will skyrocket to a level of 163 at the end of 2019, versus the current number of 122.5. Two, bad earnings numbers from the Great Recession of 10 years ago, in 2008-2009, are about to fall out of the denominator of the CAPE ratio, pushing the denominator higher. That means the overall CAPE ratio will be lower, even with no change in stock prices. That's right... Higher earnings estimates are just part of it. The "secret helper" that will drive the CAPE down later next year is simply the calendar. Between soaring earnings and this "calendar secret," the CAPE ratio is set to crash by the end of next year. The CAPE ratio falls sharply even assuming no change in stock prices. It'll fall below its 25-year average CAPE ratio based on these numbers. And even if stock prices soar from here (as I expect they will during the "Melt Up"), this big drop means valuations will not start skyrocketing again anytime soon. To sum this all up as simply as possible, stocks are CHEAP! If you want to succeed as an investor, you need to be a contrarian. That means owning what others despise. Well, my friend, is there anything out there that investors despise – or are more afraid of – than U.S. stocks today? Today, it's hard to find anyone who loves the idea of owning U.S. stocks. Folks are downright terrified. We've had a stellar bull market for nearly a decade, but no one is euphoric. Everyone expects the bottom to fall out! Investment bank Goldman Sachs just told investors to "get defensive" for 2019. And on Monday, Mad Money host Jim Cramer said this was the most treacherous market he's seen in years. The most recent Bank of America Merrill Lynch Fund Manager Survey came out this week. The poll noted fund managers have moved toward "extreme bearishness," making the biggest ever one-month move from stocks to bonds. This is NOT what happens at a stock market top. Investors should be euphoric. They should be rejoicing the recent fall as an opportunity to buy. And fund managers should be throwing caution to the wind... buying stocks hand over fist. Instead, investors are worried and gloomy. They're selling out of the market and buying bonds. This is perfect. As we head into 2019, we know that the U.S. market is cheap and hated... But what about the trend? This is the one that's going against us right now. There's no getting around the fact that stocks are in a correction. The market is also below its long-term moving averages, and the trend is down. That's bad. History proves that we can make the most money when overall prices are moving higher, not lower. Nearly all of the gains in the stock market come when the overall trend is up. One easy way to define an uptrend is to use a 10-month moving average. The moving average tracks an asset's average closing prices over a given period to "smooth out" volatility and find the overall trend. If stocks are above their moving average, the trend is up. If they're below it, the trend is down. Stocks return 10.2% a year when they're above the 10-month moving average (which happens 71% of the time). Conversely, downtrends happen just 29% of the time and lead to annualized returns of just 1.5%. Longtime readers know I often talk about the trend... These numbers are why. Stocks perform best when the overall trend is moving higher. The data couldn't be clearer. Unfortunately, stocks are below their 10-month moving average today. The trend is down, and that's a real reason to be concerned. But it's not a reason to give up completely. If stocks weren't cheap and hated, I'd be much more concerned about the trend. But stocks arecheap and hated. That means it makes sense to "wait and see" on the overall market. We don't want to make big investments right now with prices moving lower. But we should be ready to snap into action once the trend moves back into place. I still expect the Melt Up to propel stock prices to new heights. And I believe it'll happen in the next year. But we do need to be patient right now as prices move lower. For now, our outlook for stocks is cheap, hated, and waiting on the uptrend. What I don't expect soon is the next "Melt Down" in the market. We haven't seen the circumstances that usually happen before a major bust. You see, one signal has flashed ahead of every market peak of the last few decades. And it has NOT signaled yet this time around. This Melt Down indicator has a near-perfect track record... never missing a market top, and only giving a few "false positives." We're now getting close to a signal for the Melt Down indicator. But we aren't there yet. The indicator I'm referring to is interest rates. More specifically, it's the interest-rate "spread" between 10-year and two-year Treasury bonds. This spread is important because long-term and short-term interest rates move for different reasons. Longer-term 10-year yields move based on the market. But short-term two-year yields move largely because of the Federal Reserve. In a healthy market, long-term rates should be higher than short-term rates. Investors demand higher payments when they lock their money away for a long time. The Fed has been hiking rates in recent years. Short-term rates have risen. Long-term rates have too, but not as fast. Stock market peaks happened in 1980, 1989, 2000, and 2007. 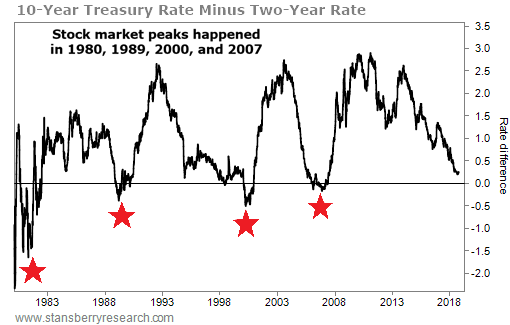 They happened every time the yield curve inverted and the line dropped below zero. This indicator has been inching closer to zero in recent months, but we're not there yet. That's important. It tells me the current correction likely isn't the next Melt Down. History says the Melt Down shouldn't begin until this indicator moves below zero. Not only that, but this tends to be a leading indicator. That means it doesn't signal at the peak... It signals before the peak. Generally, stocks have another 12 to 18 months of good times after the yield curve inverts. We haven't seen an inversion yet, so we should expect the boom to continue at some point in 2019. It's true that stocks are correcting today. The trend is down... for now. But if we look at the state of the market as a whole, there's no good reason to expect the worst. Stocks are cheap. Investors hate the idea of owning them. And our Melt Down indicator hasn't flashed a warning sign yet. I recommend waiting on the uptrend before going all-in on stocks. But I urge you to enter 2019 with a sense of optimism... not fear. Crux note: Steve's trading strategies cover every corner of the market – more than 40 different sectors – so readers will always have the opportunity to make money somewhere... Click here to learn more about becoming a subscriber today. Quoted by the Wall Street Journal, Barron’s, and the Washington Post, he is also the co-author of Safe Strategies for Financial Freedom, a bestselling book on investment strategies. Over his career, Dr. Sjuggerud has addressed hundreds of financial conferences in the U.S. and around the world, including at the New York Stock Exchange. Dr. Sjuggerud is a former stockbroker, has been a Vice President of a global mutual fund, has had his own hedge fund, and holds a doctorate in finance.